Would it surprise you to learn that during the time the New Testament was being written, the entire Christian church throughout the known world observed the Sabbath day? No, I don’t mean Sunday. I mean what most people would call “the Jewish Sabbath,” Saturday. 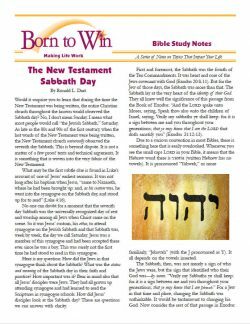 As late as the 80s and 90s of the first century, when the last words of the New Testament were being written, the New Testament church universally observed the seventh day Sabbath. This is beyond dispute. It is not a matter of a few proof texts and technical arguments. It is something that is woven into the very fabric of the New Testament. No one can doubt for a moment that the seventh day Sabbath was the universally recognized day of rest and worship among all Jews when Christ came on the scene. So it was Jesus’ custom, His ethos, to attend synagogue on the Jewish Sabbath and that Sabbath was, week by week, the day we call Saturday. Jesus was a member of this synagogue and had been accepted there ever since He was a boy. This was surely not the first time He had stood to read in this synagogue. Here is my question: How did the Jews in that synagogue think about the Sabbath? What was the status and meaning of the Sabbath day in their faith and practice? How important was it? Bear in mind also that all Jesus’ disciples were Jews. They had all grown up attending synagogue and had learned to read the Scriptures in synagogue schools. How did Jesus’ disciples look at the Sabbath day? These are questions we can answer with clarity. Due to a curious convention in most Bibles, there is something here that is easily overlooked. Whenever you see the small caps LORD in your Bible, it means that the Hebrew word there is YHWH (written Hebrew has no vowels). It is pronounced “Yahweh,” or more familiarly, “Jehovah” (with the J pronounced as Y). It all depends on the vowels inserted. For a Jew in the synagogue on that day, the Sabbath was the sign that identified his God. The Sabbath was not going away. It was a perpetual covenant to last forever. It even carried the penalty of death for a presumptuous violation. For a Jew of the first century, the Sabbath could not be taken lightly. They all knew from Ezekiel’s prophecies that failure to keep the sign of the Sabbath was a direct reason why they had spent 70 years in Babylonian exile. Note well. God gave them the Sabbaths as a sign so they might know who their God was. They were just coming out of Egypt where there was one set of gods and they were headed for Canaan where there was yet another set of gods. The Sabbath was more than just another law. It was the law that identified their God. It told them whose laws and rites they were to practice. It seems strange that the children of Israel were already corrupting the Sabbath while they were still in the wilderness. One would have thought it would have taken longer. Ezekiel proclaims the same formula we read in Exodus. The Sabbath identifies not the children of Israel, but their God. And God warned them of the consequence of corrupting the Sabbath right from the start. In the end, the Jews went into captivity in Babylon for a broad variety of transgressions, but the number one reason that led to all the others was that they corrupted the Sabbath day. So, by the time Jesus showed up in the synagogue to read the Scriptures that day, the Sabbath had been drilled into the conscience of every Jew assembled there. It was woven into the warp and woof of their faith. It was not a mere “doctrine” to be abandoned if it became inconvenient. Changing the Sabbath would have been tantamount to changing their religion. And there was no question among Jews about which day it was. They learned this when the Sabbath became the test commandment. It happened when God gave them manna to eat. He said to Moses: “Behold, I will rain bread from heaven for you; and the people shall go out and gather a certain rate every day, that I may prove them, whether they will walk in my law, or no.” 6 Thus, the Sabbath became the test commandment. If they won’t do this, God said, there is hardly any point in going further. The test was a simple one. They would get manna every morning for six days. Each day, they were to gather just enough for one day. If they kept it over to the second day, it would become wormy and start to stink. On the sixth day, though, they were to gather twice as much and prepare it for the seventh day, the Sabbath. That way, they would not have to do the work of cooking on the Sabbath day. On the Sabbath day, it would not breed worms and stink. And, so, everyone had to observe the Sabbath, and they all had to observe it on the same day. No one was allowed to choose a Sabbath for himself. After all, it was God’s Sabbath and His identifying sign, not theirs. So the Jews of the first century had no questions about the Sabbath or when it was. It was perhaps the most crucial of all their laws and customs. My point in all this is simple. When Jesus walked onto the scene, the seventh day Sabbath was an established and honored tradition in every sect of Judaism. There were Pharisees, Sadducees, Essenes, and more. They may have been divided on many issues, but they were not divided on the importance of the Sabbath day. The observance of the Sabbath on the day appointed by God Himself, was the identifying sign that they were worshiping Jehovah and not someone else. After His baptism, His 40-day fast and His temptation by the devil, Jesus was ready to begin His ministry. What was the first thing He did, where did He do it, and on what day did He do it? That brings me back to where I started. And what day was that? The Sabbath day, of course. It was a part of Jesus’ ethos, His customary practice, to attend synagogue on the Sabbath day. And it was on the Sabbath day that Isaiah’s prophecy was fulfilled. Okay, Jesus kept the Sabbath at this point. But was it His intent to later change the day of worship for His disciples? This kind of change could not have been an afterthought. If it were part of the plan, Jesus knew that from the beginning. He knew it when He read Isaiah in the synagogue on the Sabbath. So was it His intent to change the Fourth Commandment or even to abolish it? If so, how would that intent have finally been expressed or carried out? And what would have been the consequences of that change? First, it would have been necessary at some point for Jesus to clearly and definitively announce the change, and to give the reason for it. Remember that to any Jew, changing the Sabbath would have been tantamount to changing gods. This was no mere doctrinal issue. All of Jesus’ disciples were Jews. Like Jesus, they had been brought up in the synagogue and the Sabbath was a part of their ethos. They would never imagine that they had the authority to change the Sabbath without Jesus’ explicit authorization. Furthermore, if it had been Jesus’ intent to change the Sabbath to Sunday, there would have been a point in time for the changeover. There would have been a recognition that the change had been made and why it had been made. This isn’t the sort of thing you slip into gradually. Bear in mind, that for some 20 years after the ascension of Christ, the church was composed entirely of Jews and proselytes. There was no wholesale conversion of Gentiles until Paul and Barnabas went on their first missionary journey in Acts 13. You can search the four Gospels and through Acts 12 and you will not find a word about a controversy over the Sabbath. You will find no instructions for a change in the day of worship, nor even any bread crumbs to follow to indicate that such a change might have been made. This is important, because a change in the day of worship would not merely have implied a change in custom. For every Jew and every proselyte, it would have implied a change of God. And this change would have been dealt with in depth. Now, you tell me. Could such a change have been made without a ripple of it showing up in the Bible up to Acts 13? I recognize that this is an argument from silence, but an argument from silence is decisive if it can be shown that the silence is significant. This silence is highly significant. But, the Gospel was going to the Gentiles. Paul hit the evangelism trail along with Barnabas. Did a change in the Sabbath take place at that time? The Gospel had to go to the Jews first, and naturally on the Sabbath, right? Paul’s Gospel to the Jews followed. You can read it for yourself, and you will find not a word about a change of Sabbath. Naturally. What would have been the response to such a suggestion? That is not hard to anticipate, because we are told what happens when the Jews reject Paul’s message. Note well, this uproar was not because of a change in the day of assembly and worship. This was on the Sabbath day. There had been no change. The uproar was about sheer envy. There is more. Note that at this late date, it was still Paul’s “manner,” his ethos, to go to the synagogue on the Sabbath. The word is the same as the word used for Jesus’ custom. Yes, Paul went to the synagogue, because that was where the Jews were, so he could preach to them. But that is not why Luke says he went there. Luke says that going to synagogue on the Sabbath was still Paul’s ethos, his custom. Parse this passage carefully, and what you see is a church that is observing the festivals and Sabbaths but is being condemned for feasting on food and drink by Gentile ascetics. There is not a word here to suggest that the Lord’s day is Sunday. If John is indeed referring to a day of the week, and if we are to use the Bible as our best historical source, the Sabbath is the Lord’s day. Consider this instance from Jesus’ ministry. This curious expression is interesting. There were seven Sabbaths between the Days of Unleavened Bread and Pentecost. This was the second Sabbath in the cycle. Try to put yourself for a moment in the mind of one of the original disciples of Jesus. How would you have been different from what you are today? In the first place, you would have been a Jew. Like Jesus, you would have been a regular in synagogue attendance, and you would have been a Sabbath keeper. The Sabbath, you must remember, was more than just another commandment, more than a mere doctrine. It was a matter of religious identity. The Sabbath was the identifying sign that answered the question, “Who is your God.” To change the Sabbath to another day would not merely have been a change in doctrine. It would have been tantamount to changing their God. So if you had been one of the original disciples of Jesus, the Sabbath would not merely have been another doctrine to believe or not. It would have been the irrevocable sign of the identity of your God. Now, how and when did all that get changed? Why would you, at some later time, abandon the observance of the Sabbath in favor of Sunday? And what would have been the consequences of that change? Wouldn’t you expect that Jesus would have said something about it, to explain the change? For there would have had to have been a moment when the change came into effect, right? And, being good Jews, you or some of your close friends would have wondered at the change. It is very hard to imagine that one week the entire body of the disciples of Jesus (who were all Jews at the time) would have kept the Sabbath and, the next week, observed Sunday instead, with no explanation, no comment, not a ripple. So what did happen? The conventional wisdom is that the crucifixion and resurrection changed everything. However, we must face the fact that there is nothing in the New Testament that says so. You would expect a change of this magnitude would be explained somewhere; that there would be a passage that tells us, not merely the change, but the reason for the change. The Sabbath had a theology that went with it. It identified who your God was—you were a worshiper of Jehovah, not Baal, and the Sabbath established that identity. So, there should have been a statement as strong as the original statements about the Sabbath to explain who their new god was. No such passage exists. Of course, there was no change in their God. And no change in their Sabbath. There is a general presumption among Christians who do not keep the Sabbath that the church began meeting on Sunday immediately after the resurrection of Jesus, and they did it because Jesus rose from the dead on Sunday morning. This is based in its entirety on eight New Testament texts that appear to mention the first day of the week. The superficial impression is that the Church was meeting regularly on Sunday, the first day of the week. But this is entirely misleading. Six of these Scriptures refer to the same events on the same day—the day Jesus first appeared to His disciples after His resurrection. That only leaves two other passages that might lead one to this conclusion. Literally, the Pharisee said, “I fast twice of a Sabbath.” It is genitive singular and an idiom that refers to the period between the Sabbaths, for no Pharisee would fast on any Sabbath apart from the Day of Atonement. The very idea of “week,” to a Jew, was based on the Sabbath. Now, about the eight instances where the expression, “the first day of the week” is found, first you should know that Hebrews (and all Jesus disciples at this time were Hebrews) did not identify days of the week in that manner. The Hebrew manner of designating Sunday would have been to call it “the morrow after the Sabbath.” Second, you should know that in every case, the word for “week” is “Sabbaths” in the plural, and the word “day” is missing altogether—in every one of these eight instances. So here is how the first instance reads: “Now after the Sabbath, as the first day of the week began to dawn, Mary Magdalene and the other Mary came to see the tomb.” 17 And here is how it reads literally: “Now after the Sabbath, as the first of the Sabbaths [plural] began to dawn, Mary Magdalene and the other Mary came to see the tomb.” That is an odd expression since we know it was not a Sabbath dawning, but a Sunday morning. What does it mean? How does that help? Well, there are seven weeks, seven Sabbaths between this day and the Feast of Firstfruits, Pentecost.18 The day being referenced here is the first day of the 50-day countdown to Pentecost. It was the day when the first of the firstfruits were offered to God.19 It was also the day of Jesus’ presentation to the Father as the first of the firstfruits from the dead.20 So this was not merely a day of the week. It was a special day of the year—the day that began the spring harvest. As to the last of these being a meeting, there is nothing here to suggest that anything new was going on. They were frightened and confused and did the natural thing. They huddled together, trying to make sense out of what had happened. So we have found nothing about a new custom of meeting on Sunday vs. Sabbath, have we? If I was one of the disciples of Jesus, I would have found nothing here to change anything concerning the Sabbath day. Would you? There are a couple of important things to notice here. First, this is precisely the same idiom we saw in the previous six instances. It is a reference to the first day of the seven weeks of harvest and, therefore, the first opportunity they will have to store up grain for the “collection for the saints.” This was famine relief for the saints in Jerusalem. Notice the instruction that each of them was to “lay by him[self] in store” his offering of food so it would be ready to go when Paul got there. Further, that means that the first day of the weeks was not a day of worship—it was a work day to gather the harvested grain for shipment to Palestine. The use of this passage as an excuse for taking up an offering every Sunday is ludicrous to anyone who understands what was actually going on. And there is not a thing here about a church meeting. This is the only passage in the New Testament that suggests the possibility that the Church met on the first day of the week, and even here it is Saturday night, not Sunday, per se. It is also precisely the same idiom. 28 This is really thin gruel upon which to base a change in something as central to the faith as the Sabbath day, isn’t it? Here is our problem. We have the flimsiest of circumstantial evidence that the church met on the first day of the week at all. What we have is incidental, that is to say it is an isolated incident, not a custom of the church. At no point is it said to be the ethos, the custom of the church to meet on Sunday. We have to explain how the earliest Jewish Christians abandoned the observance of the Sabbath and substituted Sunday, when they did it, why they did it, and how they dealt with the certain fact that the Sabbath day was the identifying sign of their God. And we have to find all this in the New Testament. The idea is that it was the Sunday resurrection of Jesus that prompted the change. But we have an even greater problem with that. Are you ready for this? No one in the New Testament bears witness to the time of Jesus’ resurrection for the simple reason that no one witnessed it. We have an abundance of witnesses that He was alive from Sunday morning on, but no witnesses as to the actual time He opened His eyes and left the tomb. There is simply no way to get three days and three nights between Friday afternoon and Sunday morning. If you accept what Jesus said, then you have to start with the time He was buried. They rushed to get Him in the tomb, so the count starts at the end of the day of his death. 30 This alone should tell us that the resurrection should have been about sundown, not Sunday morning. There is one way you can make this work. Jesus was placed in the tomb late Wednesday afternoon. He then lay there Wednesday night, Thursday, Thursday night, Friday, Friday night, and all day Saturday—three days and three nights. The writers of the New Testament did not anticipate our problem. They never imagined anyone would use a Sunday resurrection as a reason to abandon the Sabbath, so they didn’t cover all the bases. But Luke and Mark left us a couple of bread crumbs to follow that open up a new way of looking at this. They bought spices after the Sabbath. They prepared those spices before a Sabbath. There had to have been two Sabbaths that week—Thursday and Saturday—with a day in between. So if Jesus was three days and three nights in the heart of the earth, then Jesus left the tomb Saturday evening about sunset, not Sunday morning. The early church had to know that. The reason that particular Sunday morning was important to them was because the wave sheaf of firstfruits was presented in the Temple on that morning, shortly after the time they first saw Jesus alive. It was the day of the year that was important, not the day of the week. It was important that Jesus be in the grave three days and three nights lest someone claim He had merely revived and not really been dead. One of the strangest things about the Christian faith is that somewhere in history Christians forgot that Jesus was a Jew. Not only that, but all His original disciples were Jews. Moreover, during the entire time covered by the New Testament writings, the Christian church looked very much like another Jewish sect. From the beginning of the New Testament all the way through the 12th chapter of Acts, the church was composed entirely of Jews and circumcised proselytes. There is not a word of any major change in practice during this entire time. For example, when Paul went hunting for Christians to arrest, where did he look? My job is to report and let you decide, but I find it impossible to believe that in these early years, the church had made any change in its days of worship. There is not a hint about Christmas or Easter and no suggestion that the Church had ceased observing the Seventh Day Sabbath. So if it didn’t take place within the time frame when the New Testament was being written, when did it happen? Before I talk about that, there was one major change made by the early Church and even that one is not very well understood. There were two Jewish practices that particularly identified the Jews in the first century: the Sabbath and circumcision. Circumcision became a major bone of contention while the Sabbath did not. This is what makes the silence regarding the Sabbath so significant. When a major change was contemplated, it made waves. There was a fundamental difference in worldview of those involved in this dispute. Those who were making this argument, we learn later, were Pharisees who had come to believe that Jesus was the Messiah. Now, can you imagine this group of people not being Sabbath keepers as well? It is inconceivable. Why, then, was the Sabbath not an issue while circumcision was? The answer is simple enough. There was nothing in Paul’s work with the Gentiles to change anything regarding the Sabbath. The Pharisees rightly saw circumcision as a matter of national identity. But they assumed that God was only the God of the nation of Israel. To serve God, you had to join the tribe by being circumcised. But there was a fundamental difference between circumcision and Sabbath observance. Circumcision identified the Jews. The Sabbath identified God. This is a major point of confusion among many people to this day. So how did this conflict play out? “When therefore Paul and Barnabas had no small dissension and disputation with them, they determined that Paul and Barnabas, and certain other of them, should go up to Jerusalem unto the apostles and elders about this question.” Thus was convened the great Jerusalem conference described in Acts 15. What is important to know about this section is that circumcision was not abolished. Nothing was changed, in fact. Circumcision was a matter of national identity, not of spiritual identity. It always had been and continued to be. There is not a hint here that the Apostles stopped circumcision for Jewish Christians. The issue was not merely circumcision and law keeping. It was a question of whether the Gentiles might receive the Gospel or not. According to the Pharisees, circumcision and full participation in the Jewish community was required for salvation. It wasn’t available to Gentiles. And circumcision was not abolished for Jews in any case. This is truly remarkable. The Jewish mother of Timothy made him a Jew. And it was necessary for him to be circumcised. Why am I telling you this? Because it all takes place in utter silence on the other major issue—the Sabbath. I recognize that this is another argument from silence. For an argument from silence to carry any weight, the silence must be shown to be significant. In this case, we have met that requirement. The silence speaks louder than words. The fact is that, all through this time, the entirety of the Christian church observed the Sabbath day—the same Sabbath as the Jews. Jewish and Gentile Christians all observed it and felt no need to comment on it. The Sabbath was taken for granted in the New Testament. By this time, Christianity in Rome was taking on a rather different cast from Christianity in the east, particularly in Palestine. The political structure of Rome gave both Jews and Gentiles good reason to separate themselves from one another, something that had not happened elsewhere. Toward the end of the first century, relations between Jews and the Roman Empire had deteriorated drastically. The Romans had previously recognized Judaism as a legitimate religion and had even shown a level of respect and even admiration for the religious principles of the Jews. But the Jewish wars that began about A.D. 66 changed all that. As you might suspect, the change took place over a rather long period of time. Pope Innocent I, about A.D. 417, wrote a decretal which became canon law that the church should absolutely not observe the sacraments on Friday or Saturday. This reveals, of course, that up until this time, many people did. Two contemporary historians, Sozomen (about A.D. 440) and Socrates (about A.D. 439), confirm this. There is really no question that the entire New Testament church, throughout the period in which our New Testament was being written, observed the Sabbath on the day we call Saturday. And there is no question that most of the visible church changed their day of worship to Sunday after the last of the Apostles was dead. The question we must answer is whether that change was somehow authorized or whether it was unjustified and unwarranted. The next question is, what must modern man do about the Sabbath once he realizes what it’s all about? I can make this suggestion. Take your Bible in hand and read the Fourth Commandment in Exodus 20:8-11. Pray and ask God to help you incorporate the Sabbath into your life. As much as possible, step aside from your ordinary work and require no one else to work on your behalf. In other words, give all the people for whom you are responsible the day off. Use the Sabbath day for rest and recuperation. Sleep late Saturday morning. Spend some time in Bible study. Spend extra time with your family. Take some time to think about life and about what God might have in mind for you. Don’t allow yourself to feel restricted by the Sabbath. But do hold this day apart for God. After all, it is His day, the day that reminds us who our God really is. 28 It is worth noting that this occasion falls about a week after the Days of Unleavened Bread. This is at variance with the custom in Jerusalem where the “first day of the weeks” usually occurred within the festival. The reason is simple. The harvest had to begin from one to two weeks later in Asia Minor than in Jerusalem due to a more northerly latitude. 39 W.D. Davies, Paul and Jewish Christianity, 1972, p. 72. 49 Samuelle Bacchiocchi, From Sabbath to Sunday, pp. 167 f.